Selective Pallet Racking is a special warehouse storage racking system to conserve cargo put on pallet. Each pallet need one position, thus it’s also called pallet position racking. The cargo is 100% selective, thus it’s also named selective pallet racking. The major components of racking system is upright frame and beam. Pallet Racking system is simple but reliable. According to the warehouse turnout situation and loading capacity, there are various of specification and size to be chosen. 2. The size can be tooling according to warehouse situation, different loading available. Beam level loading capacity can be up to 5000kg/level. 3. Height of single post can be 12 meter , the system is flexible and can be structure of other storage system like mezzanine floor, automatically racking system and mobile racking system. Pallet Racking also can be structure fame of steel warehouse. 4. Various of component and accessory and add into pallet racking system to meet customer special requirement, like wire decking, steel shelf, drum support…etc. 5. The total investment cost is low, easy to install and relocation. It’s suitable for different material handling equipment. 1. Upright Frame consists of 2 single post, horizontal bracing & diagonal bracing and bolts & nuts to connect them. The structure could give system a stable support. There are 2 or 3 lines of holes on post , the pitch is usually 75mm or 50mm, which make the beam height can be adjustable by 75mm or 50mm freely. Post section have 11-13 face, which increase the loading capacity. Upright Frame is made by rolling and forming machine. 2. Beam consists of one bar and two beam connectors, beam is made by 2 pieces of profile welding together, which double the thickness of top & bottom side. This maximum the loading capacity under low cost. Safety pins lock into beam to prevent beam from falling down. 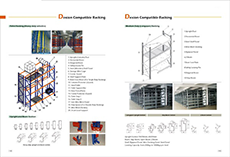 Pallet Racking is the most widely used storage system which suitable for most of cargo and lots of different industries, such as electronic, telecommunication, computer, pharmacy, furniture, garment, super market.